This detailed view shows the central parts of the nearby active galaxy NGC 1433. The dim blue background image, showing the central dust lanes of this galaxy, comes from the NASA/ESA Hubble Space Telescope. The coloured structures near the centre are from recent ALMA observations that have revealed a spiral shape, as well as an unexpected outflow, for the first time. Observations from the Atacama Large Millimeter/submillimeter Array (ALMA) and NASA's Fermi Gamma-ray Space Telescope have helped astronomers gather data from jets streaming out from a black hole in the galaxy NGC 1433. The data also showed a spiral structure in the molecular gas close to the center of NGC 1433. The scientists have also captured data from another black hole jet in the remote active galaxy PKS 1830-211. The black hole jets are believed to stop formation of stars and help regulate the growth of the central bulges of galaxies. In a process called feedback, the black hole accretes gas and grows more active, but feedback also produces jets that clear out gas from the surrounding regions which stops star formation. Black holes are regions in outer space where the gravity is so strong that even light gets pulled into it. Black holes are formed from stars that have gone supernova and collapsed into itself. Black holes vary in size with some having a mass twenty times more than the Sun. There are also Supermassive Black holes (SMBH) that are a million times more massive than the Sun. Each galaxy is believed to harbor a supermassive black hole in its center. The closest SMBH to the Earth is 26,000 light years away at the center of the Milky Way. The Milky Way's supermassive black hole is estimated to have a mass of about four million Suns and was created when the Sagittarius A star collapsed after going supernova. The study of the supermassive black hole at the center of the galaxy and its environment is rated number one in the list of ESO's top ten astronomical discoveries. 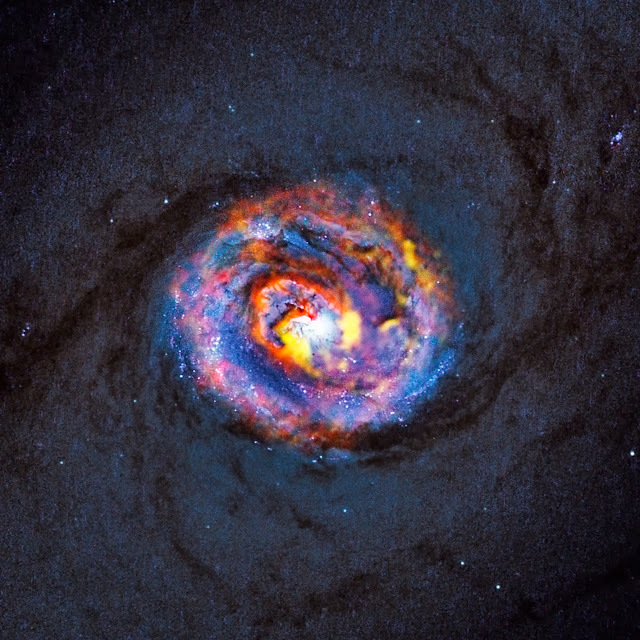 "ALMA has revealed a surprising spiral structure in the molecular gas close to the centre of NGC 1433," says Françoise Combes (Observatoire de Paris, France), who is the lead author of the first paper. "This explains how the material is flowing in to fuel the black hole. With the sharp new observations from ALMA, we have discovered a jet of material flowing away from the black hole, extending for only 150 light-years. This is the smallest such molecular outflow ever observed in an external galaxy." The discovery of this outflow, which is being dragged along by the jet from the central black hole, shows how such jets can stop star formation and regulate the growth of the central bulges of galaxies. In PKS 1830-211, Ivan Martí-Vidal (Chalmers University of Technology, Onsala Space Observatory, Onsala, Sweden) and his team also observed a supermassive black hole with a jet, but a much brighter and more active one in the early Universe. It is unusual because its brilliant light passes a massive intervening galaxy on its way to Earth, and is split into two images by gravitational lensing. From time to time, supermassive black holes suddenly swallow a huge amount of mass, which increases the power of the jet and boosts the radiation up to the very highest energies. And now ALMA has, by chance, caught one of these events as it happens in PKS 1830-211. "The ALMA observation of this case of black hole indigestion has been completely serendipitous. We were observing PKS 1830-211 for another purpose, and then we spotted subtle changes of colour and intensity among the images of the gravitational lens. A very careful look at this unexpected behaviour led us to the conclusion that we were observing, just by a very lucky chance, right at the time when fresh new matter entered into the jet base of the black hole," says Sebastien Muller, a co-author of the second paper. The team also looked to see whether this violent event had been picked up with other telescopes and were surprised to find a very clear signal in gamma rays, thanks to monitoring observations with NASA's Fermi Gamma-ray Space Telescope. The process that caused the increase of radiation at ALMA’s long wavelengths was also responsible of boosting the light in the jet dramatically, up to the highest energies in the Universe. "This is the first time that such a clear connection between gamma rays and submillimetre radio waves has been established as coming from the real base of a black hole's jet," adds Sebastien Muller. The two new observations are just the start of ALMA's investigations into the workings of jets from supermassive black holes, near and far. Combes’s team is already studying other nearby active galaxies with ALMA and the unique object PKS 1830-211 is expected to be the focus of much future research with ALMA and other telescopes. "There is still a lot to be learned about how black holes can create these huge energetic jets of matter and radiation," concludes Ivan Martí-Vidal. “But the new results, obtained even before ALMA was completed, show that it is a uniquely powerful tool for probing these jets — and the discoveries are just beginning!"